Jake Heenan comes on for Bristol. Christopher Vui leaves the field. Spellbinding play by Ben Spencer is finished off with a try. Alex Goode adds the two points for Saracens. Saracens are only a few metres out, surely they must score! And they do with Ralph Adams-Hale touching down. Piers O'Conor has made 10 good tackles so far this game. 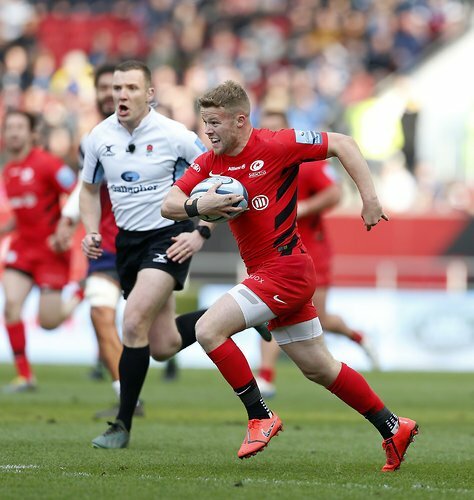 Saracens decide to make a substitution, with Tom Whiteley being replaced. Bristol make a substitution with Harry Randall coming on. Bristol make a substitution with Andy Uren coming off. Bristol sub Matt Protheroe comes onto the field. Nic Fenton-Wells departs for Bristol. Callum Sheedy does the business as his conversion attempt goes over. John Afoa played a key part in that try. A wonderful passing move by Bristol is finished off by Daniel Thomas. Fabulous play by Bristol has led to John Afoa being able to wriggle through a gap. Ben Earl comes on for Saracens. Alex Goode makes no mistake with that conversion attempt. The Saracens pack has powered over for Marcelo Bosch to score the try. Harry Thacker (Bristol) is shown a yellow card. Nick Tompkins has made 10 good tackles so far this game. Saracens decide to make a substitution, with Billy Vunipola getting some game time. 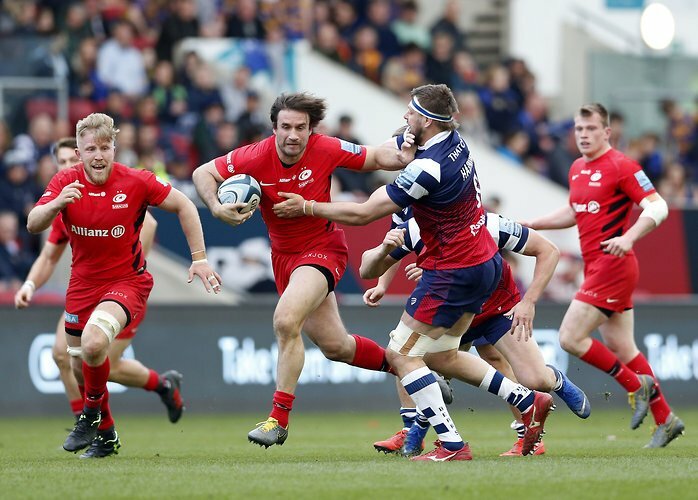 Saracens decide to make a substitution, with Michael Rhodes being replaced. Saracens make a substitution with Maro Itoje coming on. Titi Lamositele departs for Saracens. Jamie George comes on for Saracens. Christopher Tolofua leaves the field. That's a great try assist by Alapati Leiua. A series of passes by Bristol results in a try for Steven Luatua. Trouble here as Matt Protheroe breaches the defence. The touch judges have waved away the attempt by Callum Sheedy as he hooks it left. 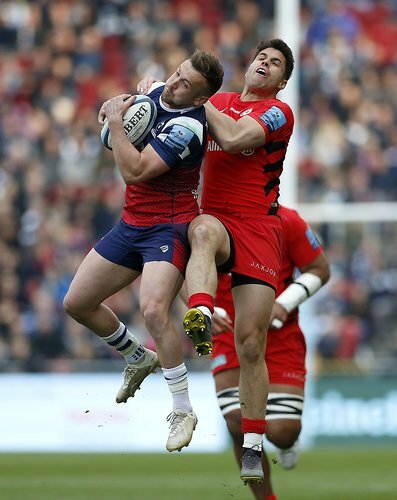 This is dangerous for the defence as Jackson Wray bursts through to advance the Saracens attack. Alex Goode has kicked a conversion. Max Malins sets up the try. Great hands by Saracens leads to a try for Tom Whiteley. A gap opened in the defence and Max Malins took full advantage. Alex Goode steps up to take the penalty but pulls it wide and to the left. The defensive line has been broken as Harry Thacker goes through the gap. 80 | Bristol number 23 converts the penalty. 79 | Bristol are keeping hold of possession but are not moving any closer to the try line. Penalty awarded to Bears. 78 | Ashton Gate is erupting as Bears put in at the scrum. 75 | Saracens have possession in their 22. Spencer opts to kick the ball which goes into touch and gives Bears the line-out. 74 | Number 23 Lozowski comes on for number 13 Marcelo Bosch. 72 | Sarries benefit from a lost line-out from the Bears but get penalised for a knock-on. Bristol's scrum. 68 | Great attacking work from Sarries we are 10m out! 66 | Bears are in the Saracens 22 but are penalised for not releasing. Goode kicks to touch. Let's go Sarries! 65 | Number 2 Thacker returns from the bin. 59 | Ben Earl comes on for number 6 Calum Clark. 56 | Yellow card given to Bristol number 2 Harry Thacker. 53 | Sarries complete a successful line-out and are awarded a penalty. Goode kicks to touch. 51 | Whole new front row for Saracens! Sarries gain a penalty and Goode boots it down the pitch. 46 | Great attacking from the Bears sees their number 15 Prothereo go over the line. 44 | Whiteley gathers a high ball and calls for a mark, he kicks the ball deep into Bears territory. 42 | Sarries are on the attack but get penalised for knocking on the ball. 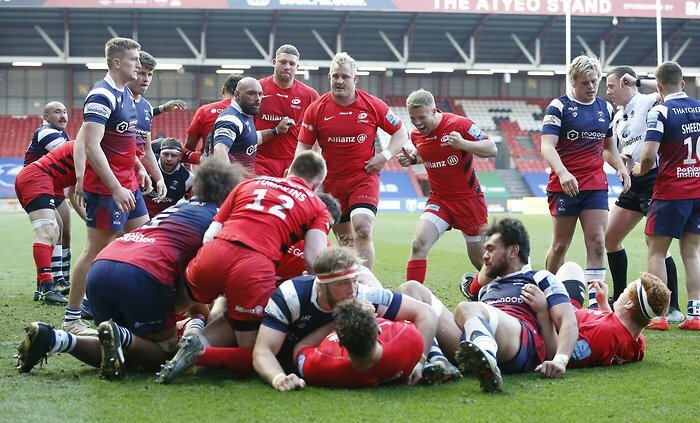 Bristol have the scrum. 40 | We are back underway here at Ashton Gate with no changes either side. 39 | Bristol win a penalty and decide to go for the sticks. 37 | Sarries win the scrum and Goode clears. 34 | Bristol are 5m from the try line and are awarded the penalty for holding on. Bristol line-out. 29 | Bears fail to secure another 3 points. 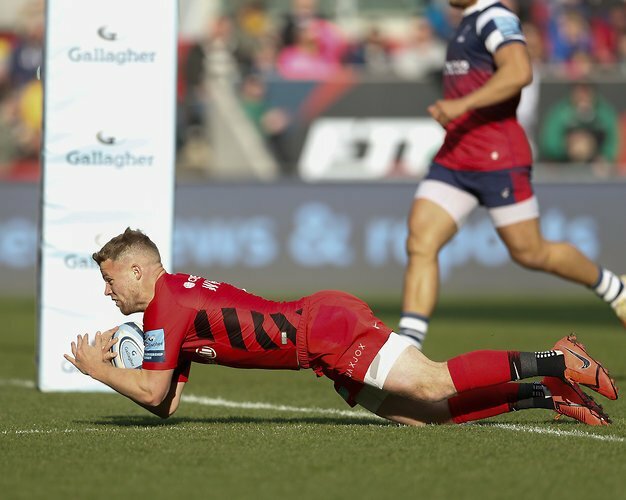 Goode clears the ball from the Sarries half and is regained by Bristol. 28 | Saracens penalised for crossing, Bears go for the sticks. 27 | Line-out is lost and bears advance through the phases but are stopped in their tracks by the strong Saracens defence. 24 | Penalty awarded to the Bears, they kick deep into the Saracens half for a line-out. 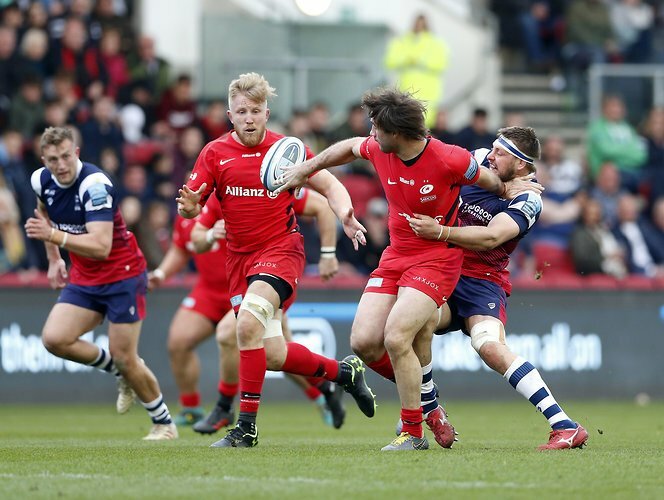 23 | Knock-on by Sarries, Bristol have the ball at the scrum. 20 | Great defensive work from Saracens puts huge pressure on the Bears and causes a turn over. Let's go Sarries! 17 | Line-out lost, Whiteley clears the ball but is charged down. Bristol line-out on the 5m line.